So why would anyone who already has a job want to go back to nursing school and get a BSN? The quickest answer to that question comes from the Institute of Medicine’s The Future of Nursing report, which recommends that 80% of nurses have a bachelor’s degree by the year 2020. Most health care agencies agree that nurses educated at the baccalaureate level are better positioned to lead the charge on holistic, preventative care. It’s understandable if you’re still on the fence. You might have a family or a nursing job already. Going back to school, especially later in life, is a daunting thought. But getting a BSN should be a serious consideration for any career-focused nurse. 1. You’ll be more marketable. While the need for nurses continues to soar, more and more hospitals are requiring nurses to hold a bachelor’s degree, even for entry level positions. Healthcare is evolving; more emphasis is being placed on preventative care, and the disease process continues to grow more complex. Having your BSN makes you more marketable and in a better position to land the job you want. Even at hospitals without the BSN requirement, having a bachelor’s degree in nursing makes your resume more attractive to future employers. By completing your BSN, you’ll have an edge over other candidates who only have an associate degree in nursing. 2. You’re a leader at heart. BSN nurses are prized for their skills in critical thinking, leadership, case management, and health promotion, and for their ability to practice across a variety of inpatient and outpatient settings. 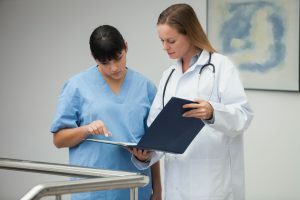 Nurse executives, federal agencies, the military, leading nursing organizations, health care foundations, magnet hospitals, and minority nurse advocacy groups all recognize the unique value that baccalaureate-prepared nurses bring to the practice setting. Critical thinking is developed through the higher education earned with a BSN, and this skill is crucial to good leadership. The communication skills taught at this level also contribute to making great leaders of BSN-educated nurses. In essence, you’ll be learning a whole lot more than just clinical skills! 3. You like the thought of better benefits. 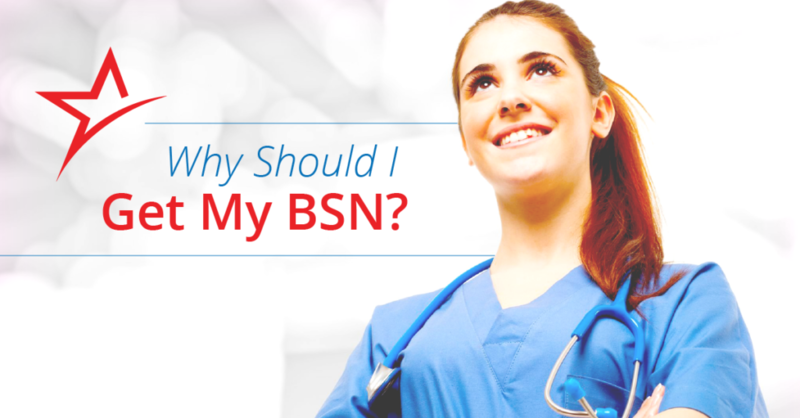 As a whole, BSN-educated nurses have access to better rewards for their labor. As a leader and an expert within the field, nurses with a bachelor’s degree typically have higher salaries and better benefits. According to research from Payscale.com in 2014, the pay difference between nurses with and without a BSN was nearly $30,000. Now that’s a number you can take to the bank! We know pay and benefits aren’t the only reasons to obtain a bachelor’s degree in nursing, but more of a good thing certainly doesn’t hurt. 4. You’ll be a better nurse. BSN-trained nurses are more apt to use and apply evidenced-based standards of care. And research suggests hospitals that employ nurses with their BSN achieve lower mortality rates, meaning patients receive a higher quality of care overall. 5. The sky’s the limit with a BSN. And speaking of an advanced skill set, if you want to advance your career, you’ll need to obtain your BSN. Without it, you’ll find it might be hard to move beyond bedside care. Many specialties require at least a BSN. In addition, if you’re looking into a career that requires a master’s degree in nursing, you’ll need to go back to school. (Nearly all of the top paying specialties require an MSN, after all.) Every master’s degree program for nurses requires — you guessed it — a BSN as a prerequisite to apply. 6. You want personal enrichment. Working and going back to school for your Bachelor of Science in Nursing is easier than ever before, but that doesn’t mean it isn’t tough. Often, you’ll be juggling the RN job you already have, a family, and any semblance of a personal life you have left. Going back to school as a nurse takes guts and grit, so when you are finally holding that diploma in your hands, it can feel pretty great. Sometimes we do things to get ahead in the world, and sometimes we do things for our own personal enrichment and accomplishment. The latter can be worth it’s weight in gold. 7. A BSN opens the door to non-hospital opportunities. Some nurses spend their whole careers in direct patient care positions and wouldn’t dream of doing anything else; others find the idea of teaching, case management, informatics, or policy more appealing after they’ve put in a few years bedside. While you may be okay with the high-impact physical activity you do as part of your nursing job today, this may not be the case five, 10, or 15 years down the road. Earning a BSN will open the doors to non-clinical jobs in the future, so you have the option of teaching or administration. 8. It can fit within your schedule. Have you ever met a nurse who wasn’t busy? Neither have we. Online education has come a long way. It allows you to keep your current job and be more present for your family and friends. You can do the schoolwork when it fits into your schedule, wherever you work most comfortably, and you don’t have to commute to campus. One of the best parts of an online RN-BSN program? You can do all of the coursework in your pajamas. 9. You can complete a quality program quickly. A bachelor’s degree in nursing in three semesters? You read that right! Not all programs are that fast, but Ameritech’s is. And just because it’s fast doesn’t mean we skimp on the education or quality. Our award-winning nurse-led RN-BSN program prepares nurses for a broad scope of care. In fact, our nursing program was just ranked #1 in Utah and #25 in the country due in large part to our Ph.D. nursing faculty. 10. You want to further contribute to the nursing profession. Even if you’re a brand-new nurse, you’re contributing to the nursing profession. You definitely don’t have to hold an advanced degree to do that! But if you want to claim a stake and help bring some definition or further change to the evolving world of healthcare — through educating others, shaping policy, or conducting research — a BSN is the way to go. Nurses have always been the backbone of healthcare, but that’s only become truer as the system changes. To have a voice and an impact in how the nursing profession evolves, you need to continue your education. That means you need to get your BSN. For more information about our accredited, online BSN program.